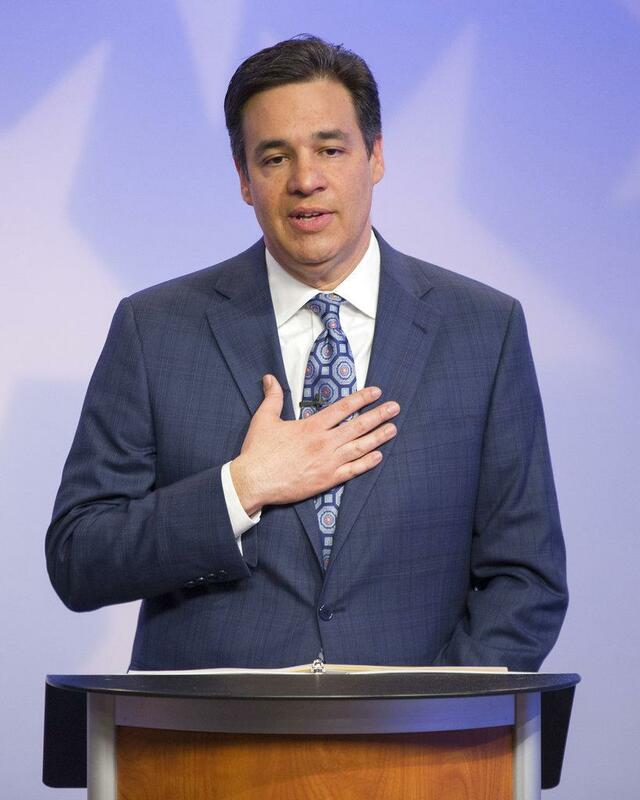 BOISE – Idaho Rep. Raul Labrador said Thursday that if the state’s voters both elect him governor and pass the initiative to expand Medicaid in Idaho, he’d consider working to overturn the voter-passed initiative. In Idaho, a voter-passed initiative has the same status as a law passed by the Legislature – lawmakers and the governor can change or overturn it or replace it with something else if they choose, though that rarely happens. They most notably did that when the Legislature overturned the voter-passed term limits initiative in 2002, overriding then-Gov. Dirk Kempthorne’s veto. During a debate televised statewide on Idaho Public Television on Monday night, Lt. Gov. Brad Little, who is running against Labrador for the GOP nomination for governor and also has opposed Medicaid expansion, offered a different answer to the same question. Little said he preferred Gov. Butch Otter’s dual-waiver proposal this year to cover about half of the gap population, but it didn’t pass. The House twice refused to vote on that proposal after it cleared a House committee. Backers of the Medicaid expansion initiative announced this week that they are within 1,000 signatures of the 56,192 signatures they need to place the measure on the November ballot. The deadline to turn in the signatures is Monday. The initiative would provide coverage for up to 62,000 Idahoans who now fall into a coverage gap, making too little to qualify for Medicaid but not enough to qualify for subsidized health insurance through the state insurance exchange. If Idaho expanded Medicaid under the Affordable Care Act, the federal government would cover 90 percent of the cost, tapping federal tax funds into which Idahoans already pay. Tommy Ahlquist, the third leading candidate in the GOP primary race for governor, also was asked during the debate what he’d do if the initiative passes, after he said he opposes Medicaid expansion. The Kaiser Family Foundation published a study on the impacts of Medicaid expansion on March 28. It found positive economic impacts for the states that expanded Medicaid, despite enrollment growth initially exceeding projections. The foundation found that state spending didn’t exceed expectations, and cost savings resulted from reductions in uncompensated care costs. She said the states that have expanded Medicaid have saved money, including Montana, which saved $30 million in the first 18 months alone. Idaho voters passed the term limits initiative in 1994 with nearly 60 percent support and affirmed it in three subsequent ballot measures: A 1996 initiative, and an initiative and an advisory vote in 1998. After the Legislature repealed the law in 2002 – with Little among the senators voting 27-8 in favor of the repeal bill – a referendum was placed on the 2002 ballot to affirm the Legislature’s move. Its language was so confusing, though, that “no” meant “yes.” The measure passed by the narrowest of margins, 50.2 percent to 49.8 percent. The ballot title was “Referendum reinstating term limits for elected state, county, municipal and school district officials through ballot access restrictions.” But the actual question was, “Shall the legislation repealing term limits for elected state, county, municipal and school district officials be approved?” A “yes” vote meant the repeal legislation was approved – and Idaho no longer had term limits for elected officials. “I think a lot of voters were very much misled on it,” said political historian Randy Stapilus, a former longtime Idaho journalist and the author of books including “Governing Idaho: Politics, People and Power,” co-written with BSU political scientist emeritus Jim Weatherby. The Legislature’s repeal of the voter-passed term limits initiative was highly unpopular, Stapilus said. Yet, he said, there was no specific blowback on the legislators who supported the move – no recall election push, for example. Published: April 26, 2018, 3 p.m. Updated: April 26, 2018, 10:08 p.m.